The transformation of a room. How to work with 25-foot ceilings. How to work with a paint color on 25-foot ceilings that you now hate. How to work with a sofa you bought waaaay too fast you now can't stand. This wall goes up reeeeeally high, and when we moved in, I knew I had to do something economical to decorate it. I didn't want to spend one meeeeeellion dollars (thanks Jennifer!) 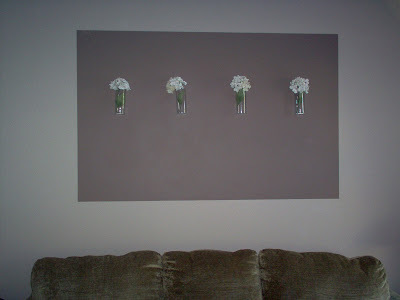 on a massive art piece, so I ended up painting a huge rectangle on the wall and hung some vases in it. Well, the ficus tree would practically devour anyone who sat near it. I have Christmas party pics of our friends shooing it out of their hair. It had to go. And all the sudden, EVERY TIME I saw those vases and flowers, I wanted to rip them off. the. wall. They were driving me mad. The wall color is still driving me nutzo and the sofa is OH-so-comfortable but a couch cover is calling my name. But we really, really love this room now. This is something I cannot stress enough -- I think making a room you absolutely love can take a lot of time. This transformation has taken five years and I'm sure I'm not done yet. You have to live with it, see what works, what doesn't -- before you find the happy ending. How amazing the few things you did made such an impact! It looks fabulous now!!! Wow! What a difference. And so little out of pocket. I am impressed. I really like it. So warm and cozy. As always it is gorgeous! Such a creative idea, LOVE it! Oh my gosh....waaaaaaaaaaaaaay better. That sofa does look oh-so-comfy. I love it! That molding has BIG impact. Very creative solution to filling that large wall. I feel better that I'm not the only person who needs years to get rooms the way I want them. Though I think they are always an evolving process. I think the first transformations looks great and the second does too. I know how you feel though, after a while you just need something different and the old way doesn't look as great as it used to. Thanks for sharing! I couldn't agree more that to design a room you truly love takes a little time. You do have to live in it to see what works where and I think we all evolve with and change with our homes. I did like the vases, but once you put the molding and the medallion in the center it felt right and it draws your eye in to feel more balanced. I love the transformation! Great job! I too understand all to well about high ceilings and not loving a paint color. Our ceilings are 18 ft high, and because of how open our house is, I decided it flowed better from room to room to do the same color. I loved Bellisima (a gold yellow)paint color when I first painted my last living room and kitchen in 2005. We moved here in 2007 and I think after seeing enough of this color over the last 2 yrs everywhere, I am done with it! There is light at the end of my tunnel though, we are Air Force and will be moving to Colorado Springs in the fall. So I can hold on a little longer until the move. :) I too am constantly adding and changing design in my home....a continual work in progress! Enjoy your new beautiful room!! Lookin' good! I love your solutions - including the sofa table and pulling accessories from around the house. I'm with you on that last part about transformations taking time. I'm finally realizing that my house will NEVER be done :). Nice job, and I think I'd paint that medallion piece the same color as the curtains and pillow to add a punch of color to the wall! Rock on!! That room is definitely one to love. I need to spice things up. What a different feel to the room! I love it! Can't wait to hear about the SOFA TABLE! It looks wonderful! I love everything you've done! Please don't add a couch cover though. Gorgeous job on the wall molding and art. The table behind the sofa grouped with all the accessories is such a stunning effect. ~WOW! You have outdone yourself Sarah. Sometimes I don't know whether I love you or hate you. You are SO STINKIN' CLEVER...! I'm so jealous of you knack for just KNOWING what will work and look great! I LOVE how this room turned out! It's really beautiful. For the record... I do like the vase idea. I just like the molding better! Very nice! I love your new darker drapes too! So... just curious.. what colour WILL your new wall colour be? heehee! WOW! You are one talented gal! I love the molding and you are so right about living in a room. I also love to "shop" my own house as well. It looks fantastic! oh how i wish you could come to my house. we are getting ready to repaint the entire interior of our house, and i HAVE NO IDEA WHAT TO DO. if i sent you pics would you offer some suggestions?! Wow! What a great transformation, Sarah! I absolutely love the after! Great job, girl, as usual! I agree with you on the "decorating over time" theme, I'm always changing something. I love the height you added, it really fills up that wall. that looks great,, i'm gonna have to try some of this molding stuff soon,, off to make my very 1st wedding cake today though, wish me luck. Thanks for sharing such wonderful ideas on your blog. It looks great, what a perfect transformation on a budget. I love what you did with the moulding and the sofa table was what the wall needed. So nice, great job. What a great makeover! Love the molding!!! Sarah, I love the new art piece you created with the molding, and look, there's you cute bunny from the $5 project sitting on your end table! You really pulled it all together. Great Transformation, I love the molding. It looks great! Those big walls are so hard to decorate. I chose not to have a two story living room for many reasons (that being one of them) so instead I go an extra room upstairs. that looks great! I am really inspired to try something like that in my bedroom! Looks amazing! Love it. I completely don't have the eye or creativity to orchestrate that kind of transformation! Beautiful!! Analysis Paralysis keeps me from doing anything with my soaring wall over the staircase. How do you reach those areas to paint anyway? Ladder + stairs = nothing good. The transformation is great! It looks really rich and inviting and I love it! You did a great job...as usual! 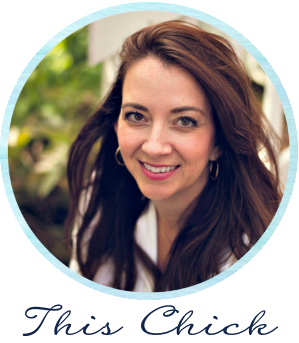 thanks for sharing your blog, I love it! I could not agree with you more...it takes a lot of time to create a room you absolutely love. I also find it harder to decorate my own home rather than for others. You did a great job with the changes. If you're ever in Vegas GIVE ME A CALL. 'Cuz I'll totally hire you to decorate my blah spaces (pretty much the entire house). Awesome room. It looks great! Ahh, the molding is fabulous!!! What an amazing idea, and a great architectural detail for so little money. Love it! Love it! What an amazing difference. I am hosting 2 giveaways - feel free to check them out! This is an INCREDIBLE transformation.. It looks SO homey and cozy now. I love it. I love the transformation. 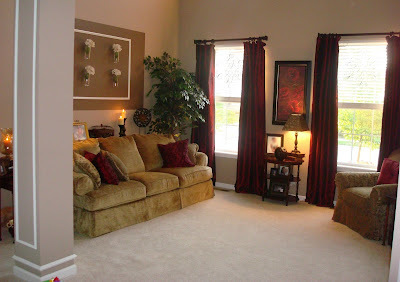 You have really framed the couch and created a great focal point for the room. This is so true! I'm constantly reworking rooms to get them just so. My spare bedroom alone has undergone 3 or 4 changes in the 3 years I've owned this place. Talk about an amazing transformation! Your living room looks awesome. Yay for you...you did a fantastic job! Oh so fabulous and thrify!! WOW!! What a difference! I have really high ceiling,too! They can be really hard to work with. But, I love them!! Your room seems really cozy now. Love it!! Love! We have the same problem, but it's over our TV...Thirty foot ceilings, brown walls, the whole deal. I need to get on top of doing something about it. Such a great idea of how to dress up a huge wall! OMG - I love NKOTB too!!! I do like your couch even you don't anymore. Your post made me feel glad that I'm not the only one who is never satisfied the first time with my decorating. I love the re-do. It looks fabulous! I have a HUGE wall and I love what you did with this. Seriously, mine has been NAKED for nearly 6 years. NAKED.COMPLETELY. Can't wait to learn how to make the table. Sarah, the transformation of your living room is gorgeous! I know what you mean about 'shopping too fast', we did that, too and now have to live with our decisions. The vases looked really nice, too, especially in the 2nd configuration that you had them in. The color looks good, but I know the feeling of wanting change. i like how you repurpose. I do a lot of that, like you say it's cheap! It looks so put together in the After! I also have a square like that painted on my daughter's wall in her room. It has always looked unfinshed to me and I have wondered about the molding. The after pic. has confirmed my decision. Thank you for the post! I would love to hear about the cheap sofa table. I NEED one BAD! I have all sorts of tools. So post away! I thought that couch looked familiar--it's the same one I have in my family room! My walls in that room (which was painted first)are a golden yellow. I like the idea of the sofa table behind the couch. I need something to pull my furniture away from the wall because the configuration of my room is funky. The medallion looks great on the wall. Overall, it's been a great transformation! I love the molding! Great idea! i couldn't remember if it was you who did silhouettes or not...but if you did i wanted to show you how mine turned out! That looks great! Very custom looking. You are amazing and I love that you've been working on it for 5 years and still making adjustments. It makes me feel better about all my "adjustments" too! Lovin' the finished product!! Way to go. And stop couch hatin'! You would be fine with your couch if you had the wall color you wanted. So go rent yourself some scaffolding and start painting! And make sure you blog about it so I can see how you do it. I have a 25 foot fireplace that needs painting! amazing how you got the rectangle on the wall so perfect! I love the touches or red you used. I may be insane, but I love the wall color now. It's just neutral enough that your couch and accessories look amazing next to it. Those touches of red and the beautiful textures really pop! What an ingenious use of a sofa table up against the wall. I've typically used them just to separate rooms but how you use it creates such great depth. I stumbled on your site and love all of your decorating ideas. We just did our wall like yours over our sofa and it turned out awesome!! wow, the transformation is amazing! I never even thought to use a sofa table against a wall before. Ingenious!